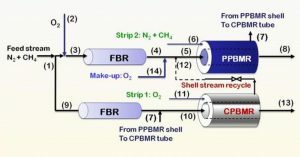 The technology presented here comprises a new feeding policy to increase the efficiency of packed bed membrane reactors, especially when they are used for the oxidative coupling of alkenes, for instance methane. The conversion of methane into higher hydrocarbons, such as ethane and ethylene, is still a big challenge in the field of catalysis, because the activation of methane is difficult due to its thermo-dynamical stability. The feeding policy of this technology can be used in single reactors and in reactor networks. In conventional packed bed membrane reactors, a high amount of oxygen is inserted into the outer shell, and only a small amount of methane is applied to the inner reactor core. With the feeding policy proposed here, it is possible to pass a high amount of methane and nitrogen into the outer shell, and only a little amount of oxygen into the core. This is achieved by separating the feed before entering the reactor. In this way, it is possible to achieve a higher concentration oxygen in the feed without influencing the conversion or the yield negatively. This invention allows oxidative coupling of methane and heterogeneous catalysis as used within the chemical industry.